Originally posted on Jan. 27, 2014. Updated and reposted on Jan. 18, 2016. This question has been on my mind a lot considering that over the past year I’ve gone from no day job to two concurrent part-time jobs. How much to work while pursuing a creative dream is a common dilemma. There’s no easy answer and the approach you take depends on your writing habits and where you’re at in your life and your career. However, if you’re considering quitting your day job, or reducing your hours to part-time, or even going back to work full-time, maybe I can help by sharing what I’ve learned over the last decade pursuing my dream while working part-time, full-time, overtime, and not at all. When I first decided to write a book, this was the option I picked. Since I was already living like a starving artist (click here for my 10 Tips to Survive the Starving Artist Lifestyle), I knew I could pay my bills with part-time work. If you can afford to live on less and have a job where you can cut back your hours, perfect! Give it a shot. This is the most low-risk option. But sometimes you don’t have that luxury and might need to pursue part-time work on top of your full-time career before you can quit the day job. Fair warning: this is a brutal, exhausting phase, but remind yourself it will be worth it when you have the extra time to write! Working part-time is best for those who write in short bursts or need daily breaks from writing. Not everyone can sit at their computer and write for 8 hours straight. If you get burnt out after 4 hours, then you might as well go to a part-time job, right? I also find that a part-time job is like having a bunch of mini-deadlines. If I only have three hours to write before starting work, I’m less likely to procrastinate. Lots and lots of people work full-time and write. If you do, you need to be dedicated to the measly hour or two a day you have to write. You can’t procrastinate or wait for inspiration. This option takes a huge amount of discipline. It’s so tempting at the end of a long work day to just relax and not write, but if you’re serious about finishing that novel, you must write! The other option is waking up and writing for a couple hours before starting your day job. The type of full-time job you have also influences your writing. Is your job creative? If so, are you creatively burnt out by the end of day, or inspired to create more? 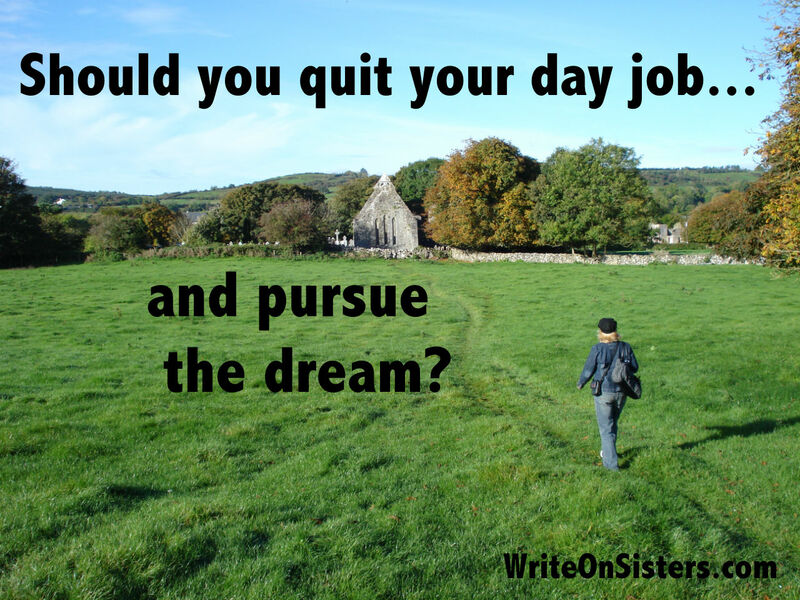 Will your job help your writing career? Or would you rather have a job that’s completely separate from your creative side? My full-time job was writing television shows. I liked doing something creative all day, but often had nothing left in the well for my own projects. Plus, TV is never 40hrs/wk. It’s more like 60 or 70 hours. So when I had enough money saved, I quit to write my book. When I quit my day job, I was already an experienced screenwriter and had a novel idea I’d been working on for a year. I was ready to write with no distractions, or so I thought. Turns out my idea still needed a lot more development, and in fact I got so frustrated that a few months in I scrapped it for a whole new idea, which took more months of development. By the end of my year off, I was finally ready to start writing. Not that I regret it. I needed the time to immerse myself in the process and experience what it’s like to write a novel full-time. So what is writing full-time like? Well, it can be lonely. I missed my co-workers. But if you hate your co-workers, that won’t be a problem. Writing full-time is awesome when the words are coming fast, but demoralizing when you hit a slump and have nothing else to do. This option is best if you already have a lot of writing experience and know how to handle those highs and lows. So with that in mind, before you quit your day job make sure you: 1) have a few years of writing experience under your belt, 2) have a solid novel idea that is ready to write, and 3) have a backup plan for when your money runs out. My backup was keeping in contact with people in the TV business, and whenever I was a couple months from being flat broke, I picked up a gig with them. After living all three options, I learned the best one for me is to write while working a part-time job. It helps with my motivation. I procrastinate less. And I need breaks away from my novel (especially during the development phase) to help me recognize and solve story problems. Though if I’m ever lucky enough to be a full-time novelist, I’ll deal with this by having two projects on the go, so when I need a break from one novel, I’ll work on the other. Deciding what’s right for you might take some trial and error. It did for me. And if you’re pondering the question of whether to quit your day job, hopefully this post gave you some insight about the options. Anyone else have tips for choosing a happy working-writing balance? Please share in the comments! Thanks for the comment, Natalie! I have NO tips. For years I wrote a syndicated weekly column (yes, I’m THAT old…) in the middle of the night when the last child finally fell asleep. But said children’s unreasonable expectations of a life that included a roof over their heads AND regular meals sent me over to the dark side (executive HR). At last the nest was empty, and I left the corner office and fancy car for to become a partially-employed dog-walker/writer. Life is so very, VERY good! So funny that I found your post just after posting something about this myself this morning! We just moved north of the city in 2015 and last year was all about building our house and getting it ready to live in before the snow fell. Then the holiday season was upon us. Now it’s time to figure it all out! The work I had in the city didn’t allow for any writing time (60-hour work weeks, getting up at 4:30 for the commute, single motherhood, …) and I think many people out there tend to suffer the same fate. If you have a mortgage and children, part time work really won’t cut it. But now, with my son “grown and flown”, the mortgage gone and a new husband, I also don’t have a job. We have savings, but I find it stressful to see them dwindling. I want to find work that gives me the room to write my own stuff without the worry about having enough income. First, I’m going to look online for a variation of your part-time approach. There’s a lot going on that needs the services of a writer/teacher! I hope to find something that gives me flexibility so that my writing can remain a priority. We shall see! This article comes as I’ve just given up my part-time day job to go freelance and so it was very interesting for me to read your analysis. I like the freedom but I am missing the social contact and plus, it’s hard to get freelance work when you’re just starting out. I am trying to write, edit and look for work every day and this is working quite well but I’m not sure if I will be able to keep it up long-term. If I had enough work to keep me busy for half the week, it would definitely be easier but I would still have to work hard to see people. I am making sure to plan visits every week so I don’t go mad in the meantime! Getting the balance is hard but I think it’s important to give a new way of life a try and even if it doesn’t quite work out, at least I’ll have tried. That’s a great point, Julie — give it a try even if it doesn’t quite work out! We can always adjust as we go. Good luck on your new freelance endeavour! I had a 2 year period where I had no job and it was stressful. Lots of time to write, but lots of time to worry about getting bills paid. I prefer to have a part time job so I have a steady income, but still time to write. I had no choice about quitting my day job. When I got downsized for the second time in less than five years shortly after our economy imploded, I couldn’t find work. After working part time for the census for a while I was eligible for Social Security, so I took it. I was nowhere near ready to retire, but had very little choice. So I finished my degree program in creative writing, finished the memoir I’d been working on, and now I have three published books and three, related novels in progress. I’ll be shopping the first one this spring. Working in isolation so much of he time makes it easy to procrastinate and I’ve certainly done my share, but I’ve decided that I really have earned a more relaxed schedule–without giving up a few hours every day to write. A tough time for sure, but it sounds like you came out the other side with the prize – three published books! Congrats! I don’t know whether my current situation counts as part-time or full-time. I’m at university, which means I carry a full load of either 5 or 6 classes a semester, and I work about 20 hours a week on-campus (with only a bit of time to do homework). However, I don’t work on breaks. In a way, it feels very stop-and-go, which I’m not fond of personally; I would prefer a sort of steady go that isn’t too exhausting. I have tried all combinations and permitations of paid work and writing. It’s one of those things where the writing project may require a different process than the last writing project, and so I’ve constantly had to reinvent my life to fit the project. I’ve moved many times and quit jobs and not taken jobs and then really needed a job and meanwhile not much writing gets done because I’m constantly flipping my life upside down and having to resettle myself. I think the best thing may be to have a paid job that is constant; ideally a part time job with the same hours each day. Then there is no time wasted with juggling schedules and having to mentally reframe every day. You know you always have to be at work at 1, so you’ve got all morning to write, and you do it because you don’t have to think about it. Right now I am doing part time work from home and this doesn’t work because I’m not self disciplined enough. I need to work outside my home, at a certain demanded time. But unfortunately in my paid industry, which is also creative, it doesn’t work this way! Lots of mental struggles to be productive, and late nights getting things done. Argh!! I feel your pain! I too have gone through a myriad of part-time employment opportunities, trying to find the perfect fit, but like you said, it depends on the writing project too, because each one is different and requires different amounts of time and mental attention. I’ve also longed for that part-time job with steady, predictable hours so that I don’t have to worry about money or my schedule, but I have yet to find it. However, I’ll keep looking. Here’s hoping we both find the part-time job we need! Thanks for the comment, Meghan! I write full-time, and I’ve found that I must structure my days…start at the same time, quit at the same time, and so forth. It’s easy to stay in your PJs and goof off on SM, so structure is crucial, IMO. It’s not for everyone, but it works for me. Well said – being structured is key to writing full-time. Though I must say that I always found it difficult to enforce a quitting time… which probably made my shifting start time even more volatile. When I’m ready to write full-time again, I’ll come to you for some tips! Thanks for the comment, Sue! Thanks for writing that, and for laying out the pros and cons of each kind of balance. I think a lot of people believe that ‘if only’ they could write all day long, for ever, with no distractions or disturbances, that the words would flow like honey. I think that writing with boundless time ahead is a bit like the times back at school when the English teacher would tell us to write an essay on ‘whatever you want.’ Suddenly we had no idea what we wanted. If she’d said ‘write whatever you want and include the word ‘vulture’ in your essay,’ then we would have been away. There’s something about limits that sets words free. Your year of writing without the distractions of work sounds perfect – partly because you had a plan, experience and a foot in the camp of the world of TV so that you could step back into it for a bit when necessary. And I’d agree that part time work – especially in a job where you walk in and walk out again at the end of your paid hours – is a good situation. There’s inspiration to be had in the world of paid work and there’s glory to be had in coming home and settling down to write, rather than spending the whole day trying to motivate yourself to write. I often wonder how we humans would live if we were immortal. It’s death and the awareness of death that forces us to value our days of life. If we were immortal, I’m not sure if we’d bother to do much, if we knew we had all the time in the world to do it in. Wise words: “there’s something about limits that sets words free.” In my experience, this is so true! And interesting thoughts regarding mortality. I know I worry about not having enough time and that motivates me to write right now and not later. Thanks so much for the comment, Elaine, and all the best to you too! Sounds like you’ve found a fantastic balance, and are all set up to make the dream happen!